Good CRM = A Red Swingline Stapler | Can someone please explain...? 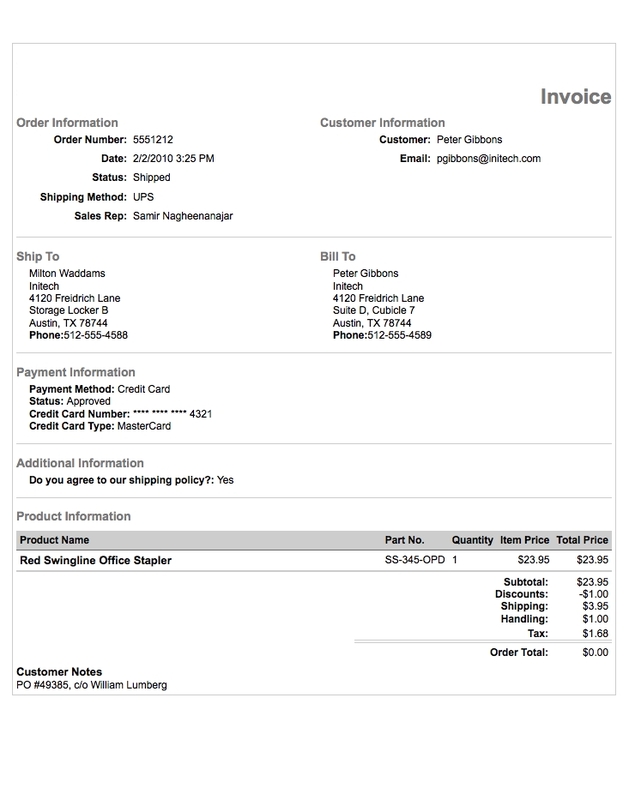 We’ve been building an e-commerce website for a client and my art director Otto sent me the following sample invoice. It’s one of the automatic forms that’s part of the Network Solutions e-commerce solution we’re using — the only thing Otto did was add my client’s logo and address (which we’ve now removed to protect the innocent). Right about now you’re either laughing hysterically, humming, “Damn, it feels good to be a gangsta” or wondering what’s going on. For those of you in the latter category, the specifics of the invoice relate to a prop from the movie Office Space, much of which takes place in a cubicle farm computer company called Initech. The names in the form are all characters from the movie. Now Network Solutions didn’t need to fill in the sample invoice with anything funny. They could have used a “widget” instead of a red Swingline stapler. They could have used John Doe or Pat Stephenson instead of Peter Gibbons and Samir Nagheenanajar. But they chose to use elements from an iconic, classic movie virtually guaranteed to bring a smile to the face of almost any programmer, designer, entrepreneur or wage slave of a certain age. And by doing that, they not only made Otto’s day, they made mine, and then I showed it to my creative director and another art director, both of whom loved it. I showed my wife, who cracked up. Now I’m blogging about it. And still smiling. That’s good customer relationship management. And good word of mouth. And it didn’t take much more effort than the plain vanilla boilerplate version would have. All it took was a little empathy, a little creativity, and an understanding that even the boring parts of our jobs don’t need to be soul crushers unless we let them. So can someone please explain to me why red Swingline staplers are the exception rather than the rule? And while you’re doing that, I’m off to find a baseball bat. I’ve got a date with a fax machine. I think there’s an extension to this story that needs to be told… Swingline staplers were not available in red before the release of “Office Space.” Due to overwhelming demand from fans of the movie and suffering office workers everywhere, the Swingline company thought it would be a fun idea to add red staplers to their product line! What a concept… Extend some goodwill and make a profit at the same time! Hey, how come the sample invoice total is zero? Yeah, I’m a data nerd? Um, yeah, right. Um, I think you’ll find that, um, the answer to that is in your daily TPM report. You do have your TPM report, don’t you?